> OMG! You’re the lucky owner of a brand new candy nail salon! 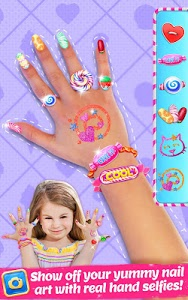 > You’ve got so much to do – the customers are rushing in for your famous candy nail art manicures! > Dress your customers up in rockin’ outfits to match their tasty manicures and pedicures! 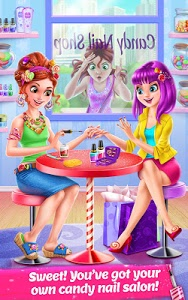 > So many contests – who will win 1st place for sweetest manicure, yummiest nail art or sugary nail jewelry? > Knit cozy candy gloves, so your customers can stay warm and show off their amazing nails! > Polish all of the customers’ nails with super cool, sweet candy nail art and patterns! 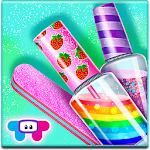 > Take hand selfies to show off your incredible candy nail art skills and beautiful nail jewelry! > Nail lab time! Combine ingredients and colors to make your own nail polish! Don’t forget the candy glitter! > Your customers just love their gorgeous manicures and pedicures! > Yuck! Why is that customer’s nail all infected and gross? 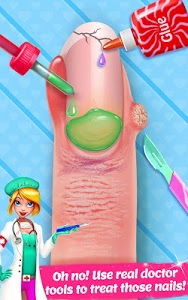 Get them to the doctor before their nail falls off! Similar to "Candy Nail Art - Sweet Fashion"